This season Buddies in Bad Times celebrates the 20th anniversary of the multi-award-winning company da da kamera with a retrospective of three of Daniel MacIvor’s one-person works. This is the last time to see these plays since MacIvor and producer Sherrie Johnson plan to dissolve the company to move on to other projects. First up is Here Lies Henry from 1995. The title is a pun. The Henry (MacIvor) we meet is an inveterate liar, but the play is also about death. It begins when a young man stumbles into a dark square outlined with light, cringing with embarrassment to be in front of an audience. Once, after hilarious fidgeting, he composes himself, we learn about a house, a body in the next room, a fire, that he’s gay, that he’s a liar. This last statement reveals the play as a theatrical variation on the age-old paradox of Epimenides of Crete, who said “All Cretans are liars”--just substitute “actor” for “Cretan”. While our natural impulse is to piece together the “truth” of Henry’s story, we simultaneously realize the futility of doing so. As Andy Moro’s beautifully precise lighting tightens in leaving only Henry’s face in light, we realize that the “truth” of Henry’s story is the same as the “truth” of anyone’s life in this seemingly trivial but brilliant play brilliantly performed. Note: A version of this review appeared in Eye Weekly 2006-09-28. 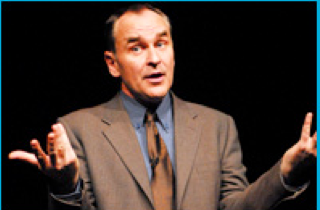 Photo: Daniel MacIvor. ©2006 Guntar Kravis.